France midfielder Adrien Rabiot has refused to be named on the national team's standby list for the World Cup. The 23-year-old Paris St-Germain player was not in the final 23-man squad but among the 11 reserve players. Reports in France say Rabiot, capped six times, had emailed coach Didier Deschamps saying he would not "be able to follow the training programme". Noel le Graet, president of the France Football Federation, said Rabiot's reaction "was very surprising". He added in a statement: "Rabiot is a high-quality player and an endearing boy who has always behaved well in national selections where he has evolved. "His disappointment does not allow him to give up and not to serve the France team. To be part of the collective of France, to be among the best French players, is a chance and a privilege in the career of a player. "He made a bad decision. He penalises himself and sanctions himself alone." 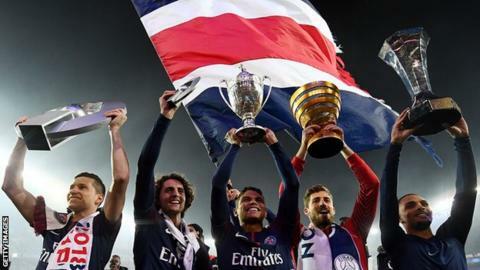 Rabiot made 45 appearances in all competitions for PSG in 2017-18, winning a domestic treble. France are in World Cup Group C alongside Australia, Peru and Denmark. Adrien Rabiot is a huge talent but PSG supporters will tell you that his form fell off a cliff after they were knocked out of the Champions League by Real Madrid in early March. And as Didier Deschamps has pointed out, he has also rarely performed at his highest level in a France shirt. So although you can understand his disappointment, you can also see why Deschamps decided to leave him out of the 23 when he has so much talent to choose from. With all that in mind, refusing to be on the standby list will only do further damage to his reputation in France, where he has already - fairly or unfairly - developed an image as a player with a big ego and a sense of entitlement. France fans may take a long time to forgive Rabiot for this.